The picket line outside the recycling centre in Forfar. 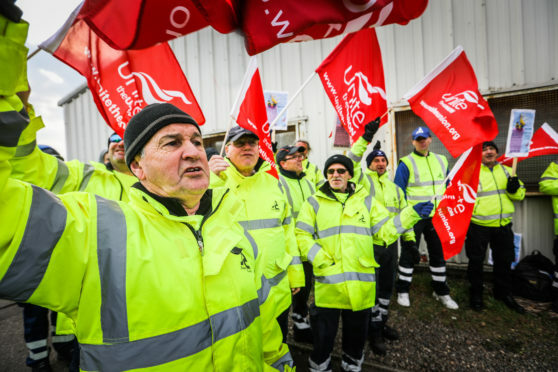 Picket lines were set up throughout Angus as representatives of Unite the union protested against a new two-shift system brought in at the beginning of the month by the cash-strapped local authority. The changes are to allow the council to make ongoing savings of £160,000 a year from the service, remove approximately £2 million of vehicles from its fleet and avoid job losses. Household waste is now collected from 6am until 10pm, which Unite members claim is impacting on their work-life balance and is putting lives at risk. Les Scott, 55, workplace representative for Unite the union, said: “From the very start Unite the union has brought up serious health and safety concerns, and also the work-life balance for these guys. “We are one of the lowest paid groups in Britain doing this type of job. These guys don’t want to do this, they would rather be out doing their job. “We feel we have to continue with this action, not to prove a point, this is to state we have had enough. A reduced service operated throughout Angus last week and the 48-hour stoppages are scheduled for Mondays and Tuesdays through to the end of June. Full details and updates on the bin strikes are available on Angus Council’s website.